Traditional novels create meaning through narrative; each scene means in relation to the story. What if, however, you believe meaning is not so easily acquired, that we are now so connected and disconnected that describing reality using a straight path (plot) is no longer enough, or even possible? 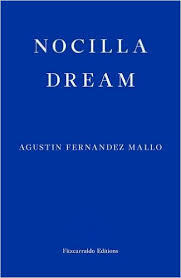 Perhaps, then, you might write a novel like Agustin Fernandez Mallo’s Nocilla Dream, one made of 113 brief chapters, many of them extracts from other books, woven from numerous strands and storylines, and set in the debatable lands between fact and fiction. A later chapter describes the popularity of surfing in a Chinese province, Tsau-Chee. American culture is referenced throughout: young boy, who first appears in chapter 3, is known as Billy the Kid, and another character as Pat Garret. Even Falconetti has borrowed his name form Irwin Shaw’s novel Rich Man, Poor Man. Loneliness runs through the novel. When characters do connect it is rarely for long. Sometimes there are only a few minutes of conversation as between Fernando, the pump attendant at an isolated gas station, and a group of female surfers passing through. On other occasions, relationships blossom, for example between Sherry and Clark only to end suddenly: Clark, having taken Sherry from one of the brothels which bookend the highway, later abandons her. Other characters, like Falconetti, are solitary by nature. Perhaps our struggle as a reader to make connections across Mallo’s novels mirrors our struggle to make connections across the disparate elements of modern life. Certainly, we should not look to it for simple answers. It has a cumulative effect, though not one as moving as, say, in the work of David Markson. Intriguingly, it is the first part of a trilogy: it’s to be hoped translator Thomas Bunstead is at work on volume two. You are currently browsing the archives for the Agustin Fernandez Mallo category.